Digital Employees are utilized to eliminate repetitive tasks and increase the productivity of your workforce. Digital Employees allow existing employees to focus on their core competencies by automating the repetitive tasks that existing employees do, in exactly the same way they do it; using the same applications and data. As a result, organizations free up valuable human capital and allow them to focus on higher level activities that utilize their capabilities and skills. 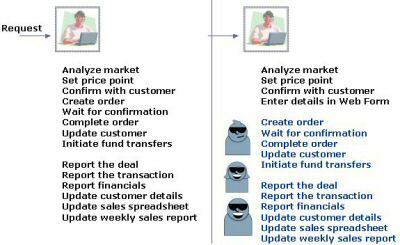 Employees enter customer and deal information into your database. They funnel information into a variety of systems. Adding Digital Employees freed up valuable human assets, allowing regular employees to enter information a single time, and automatically propagating it into all other necessary environments. How much time would this save your organization every day? Using Digital Employees in this work scenario resulted in a 70% productivity gain on market analysis and reporting accuracy. 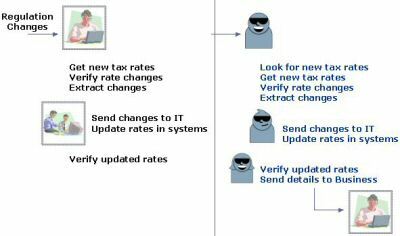 Employees monitor state regulations, verify publications, look for new tax rules and rates, and download rates from a provider or the government to send them to internal IT. Internal IT applies the rates and tests updates in the system. How often are rates not updated on time? How often are rate changes not propagated to each store? And how much time and exposure would be reduced by automating the complete cycle - from looking for new rates to updating systems? Using Digital Employees in this work scenario has reduced errors by 90%, automatically updating all of the necessary people via email. For the first time this allows the regulator to report on, view, and monitor the progress of changes made in the system.